1. Heat the butter in a medium-sized sauce pan. 2. Fry the onion in the butter until softened. 3. 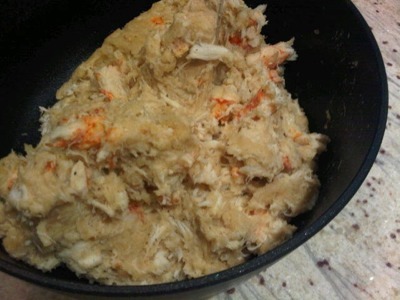 In a blender, mix the milk, flour, salt, seafood seasoning and black pepper. 4. Use a wooden spoon to stir the blended ingredients with the butter and onions, over low heat. 5. Stir constantly until mix forms into a loose dough-like consistency. 7. Add the dry white cooking wine and cooked, ground lobster meat. 8. 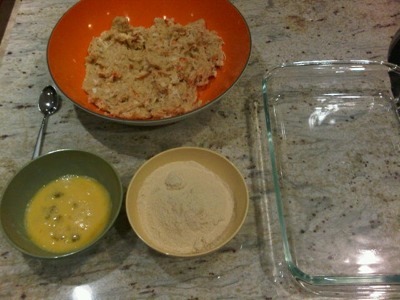 Mix the ingredients well to form the batter. 9. Set the batter in a shallow bowl and place in the refrigerator until it cools completely. 10. Once the batter has cooled, take a spoonful and form it into a croqueta shape (cylindrical, about 3" in length and 1" in circumference) with your hands. 11. Roll the shaped batter in the egg, then the Cuban cracker meal. 13. Heat the oil in your deep fryer to 375 degrees. 14. 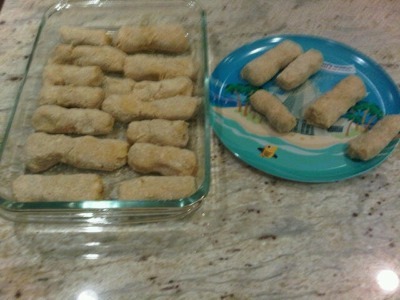 Fry the croquetas, without overcrowding the fryer basket, for about 3 minutes per batch. 15. 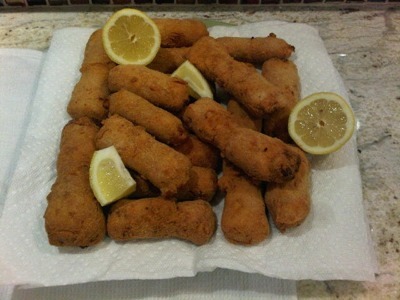 Remove croquetas from the oil and place on paper towel-lined plates. I had promised my friend, Sef, that our next cooking session would be around croquetas, since my hubby gave me a rockin' deep fryer for Mother's Day. Since Sef is a meat guy, and my deep fryer was starting to collect dust, I went around my promise by making Recipe #271: Croquetas de Langosta (Lobster Croquettes) and saving all the meat ones for Croquetapalooza: Burger Beast visits La Cocina de Christina, round two. On a visit to the Keys, I made friends with a fisherman that nearly keeled over when I told him I wanted to buy lobster meat to make croquetas. ¿Croquetas? No, eso no usa la masa de la cola. Eso usa la masa de la cabeza. Lobster meat in the head? From the head? What do I have to do with the head? No way. For free? You'll give me the heads for free? 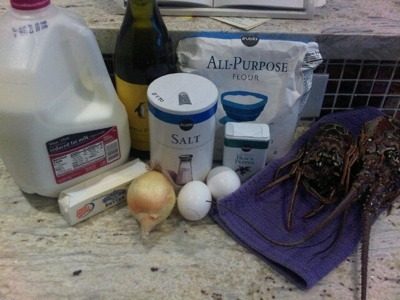 When I showed up at home with lobster heads all excited to make croquetas, my husband gave me a look I knew. This wasn't the good idea I thought it was. Getting meat out of lobster heads take lots of patience, muscle and cutting. Cutting those sticks off the top of its head (antennae), cutting through hard shell to get to the meat and then patience to scoop out the meat, and discard all the yucky gross brains (or whatever they are). 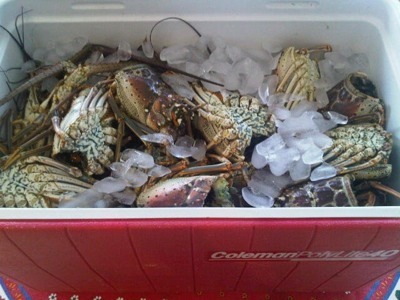 Once you boil the meat, you know you're on the right track, but before then, during those three hours of cutting meat out of lobster heads, I wanted to find that fisherman and give him a piece of my mind. For free. Making the béchamel sauce made me feel super Cuban. But I was scared, let me tell you. That sauce comes together fast and furious so you best be on your toes as you add, osterize, mix and heat. I thought for sure I had burnt the sauce since it came together and thickened so quickly. But no, it was right on point. One comment about the wine I used - Pinot Grigio. Not a good wine to use because it seems to be less salty than the dry white cooking wine I typically use. Maybe Fred Tasker will read this and enlighten me on my theory, but I'm not taking any chances. Use dry white cooking wine for the béchamel. There were a few monster croquetas, similar to, er, Frankenstein fingers, for example, but after all, it's what's inside that counts. Except when it comes to lobster brains. Those shouldn't count. Last Christmas, when my mom and I had taken a trip to Williams Sonoma to pick up my family Secret Santa gift, the rolling pin, we stopped by the tureens and she told me how much she liked them. I hadn't given them a second thought before then. I had known of soup tureens but had never imagined owning one. They look so fancy, so formal. For mother's day, my mom gave me my very first soup tureen. I had no idea what to do with it. Back to the soup chapter we went. This recipe calls for a soup bone. Of course, I had no clue that soup bone was an actual item that could be purchased. Thank goodness my neighbors were at the grocery store when I got there. They showed me where to get the bone (by the meats, duh). My Facebook friends, especially Jami, helped me decipher that "guisantes frescos" are fresh legumes. Do people in Miami say "guisantes frescos"? 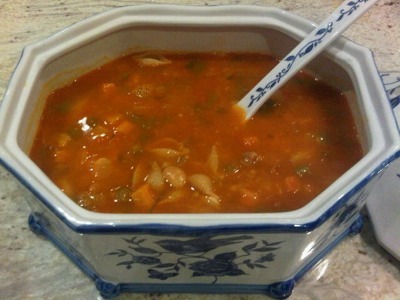 I don't use that term, but thanks to Jami and a few others, I was on my way to making Minestrone Soup, a la Nitza, after the thorough trip to the grocery store.